Bang! Bang! Bang! (loud expletive)….hammer, hammer, (very exuberant expletive) ….grunt, saw, saw, saw. (double expletive….) What do you mean I measured once and cut twice and it’s still too short??? To anyone who has ever remodeled their house and lived to tell about it, I salute you! Doing it yourself is certainly something to be proud of but how does a simple project end up turning into a huge green monster? Many years ago the idea of adding a “small” glass sun room on the back of our house (drawn meticulously on a napkin of course) turned into a less “small” living room-dining room-garage extension project. Don’t get me wrong, our family has enjoyed that additional space tremendously since then, but apparently we mentally blocked the “pain” for our protection, because unwittingly we are now smack dab in the middle of another “small” project – wood flooring for the basement. As with the prior remodeling endeavor, this “simple wood floor” project, has escaped it’s cage , evolved exponentially and has taken on a life of its own as a complete renovation of the basement including leveling the concrete slab for the wood flooring, new lighting, refreshed painting, ceiling and wall repair, updated baseboards, new doors, and of course, brand new furniture once we are finished. (can you say “I love you, IKEA”?). Don’t get me wrong, I really do love getting my hands dirty and my husband is a genius when it comes to home improvement, it just never seems to go as quickly (or as inexpensively) as originally anticipated. I think it’s a conspiracy! Case in point: I am entrusted with a seemingly simple mission of locating oak trim that is 2 inches wide. I feel I can handle the assignment so off to the home improvement store I go! After wandering aimlessly up one aisle and down another, I find what I am looking for — or so I am tricked into believing. (Refer to the photo for full visual impact of the horror). 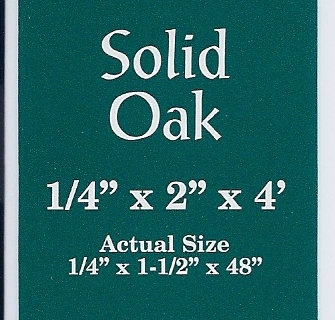 The measurement is listed as 1/4″ by 2″ by 4″. I privately congratulate myself on such skillful execution of this mission — 2 inch oak trim needed… 2 inch oak trim located — and I prepare to pay for my selection. BUT WAIT! 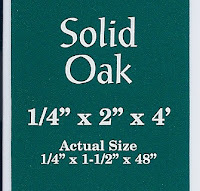 My keen eyes fall upon the conspiratorial “actual size” – 1/4″ by 1 1/2“ by 48″. One and one half inches….What’s up with that???? Despite this unexplainable strangeness, I can see the light at the end of the construction tunnel (of course it helps that we have already put up the new light fixtures but…) I am sure that the results, should we live through them, will be well worth the effort! If you have undertaken a similar home improvement mission, after your project is complete and you can sit back and admire your handwork, don’t forget to call me, your insurance agent, so I can admire it too. (And make sure your insurance coverage is still adequate to provide sufficient protection). After all, doing it yourself is “fun” enough ONCE, but if your improvements have the misfortune of some future damaging loss event, I am sure you will want to have the funds to hire someone else to do the repairs the SECOND time. And let THEM deal with the peculiarities of construction measurements! Call our agents at The Writer Agency, LLC 308-436-4202 or click: http://www.insurance-by-katie.com/ to see how we might help you today! Do you have any “interesting” remodeling stories or photos to share? Post them here!